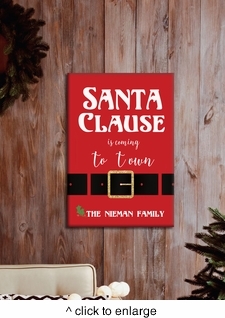 DETAILS: Our Santa Clause Is Coming to Town Christmas Canvas Wall Art is the perfect addition to any space in your home. From your den to the family room, our holiday signs are sure to catch your eye and make the season brighter. MEASURES: Sign is approx. 14" x 18" x .75"
PERSONALIZATION: Personalize with 1 line up to 20 characters. Design is standard.